2 June in the neighborhood, “Clear coast” held a competition of “Vertical challenge” — professional rescuers and firefighters and ordinary citizens of Novosibirsk to speed up on the 26th floor of the skyscraper. 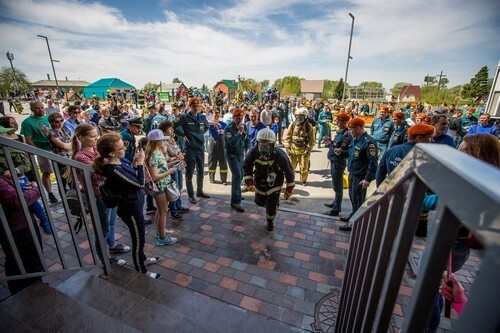 The competition was attended by 66 employees of the emergencies Ministry and fire departments of Novosibirsk, and 22 normal people and residents of the city. Compete the teams were in full gear weighing more than 20 kg and to breathe using compressed air. An exception is made only for children who fled light. The fastest of them overcame the 26 floors in less than 3.5 minutes. The winner of the competition became a fireman firefighting and rescue part № 2 Dmitry Belyakov — he overcame 26 floors in 2 minutes 46 seconds. Among the locals defeated the Roman Cherepanov, who ran up to the top floor of a skyscraper in 4 minutes 35 seconds. A local girl, Tatiana Pinaev and Polina Beliakova, coped with the task in an average of 7 minutes. Before the competition rescuers conducted a demonstration exercises to rescue people from the high-rise apartment: they demonstrated how to evacuate residents of the upper floors in a smoke. For spectators on site “Clear Bank” gave a master-classes on self-rescue, first aid and exhibition of firefighting and rescue equipment. For the first time in Russia competitions “Vertical challenge” was organized in Saint-Petersburg in 2016, then they took part 186 of rescuers. Last year, a competition is international. In Novosibirsk has to save not only those who were in the fire: for example, this week, rescuers removed from the bridge man.